Academics from Southampton will bring research to life through Pint of Science. What do you get when you place over 40 academic experts in five public venues in Southampton over three consecutive nights? That’s the recipe for this year’s instalment of the ever-popular Pint of Science (PoS) festival, hosted by the University of Southampton from 14-16 May. Through Pint of Science, academics from Southampton, joined by some additional invited guest presenters, will bring research to life through unique talks, demonstrations and close-up experiments at locations throughout the city. "Bubbles for bone: using bubbles and ultrasound to heal bone fractures" – take a futuristic journey where bubbles and drugs are used to treat fractures which cannot heal naturally where the aim is to help the injured site by regenerating new bone! Alongside the main talks, each evening will also include a range of fun, science-related activities including live experiments, science comedy, fun quizzes, brain teaser tests and other interactive games. In addition, the University’s hand-on ‘Stem Cell Mountain’ will make an appearance, combining the fun of a pinball machine with key biological concepts. Participating venues across the city this year include Stein Garten (High Street), Mango Thai Tapas Bar & Lounge (Canute Road, Ocean Village), Slug and Lettuce (Above Bar), The Talking Heads (The Polygon) and Mettricks Guildhall. “We’re very excited about the programme we’ve lined up for this year’s Pint of Science in Southampton,” said Sophie Arthur, PhD researcher in embryonic stem cell metabolism at the University of Southampton and Communications Co-ordinator for the Southampton events. “The whole programme is about engaging people in scientific research in a relaxed atmosphere where they learn and be entertained at the same time. 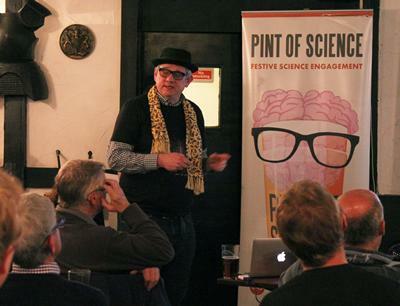 Tickets are just £4 per night and available via the Pint of Science Southampton website.